Son of the painter Friedrich von Kaulbach (1822-1903) and his first wife Sophie Mathilde Knosp (1818-1854). He studied with his father in Hanover and in 1868 in Nürnberg under August von Kreling und Karl Raupp. In 1871 he copied the old masters in Dresden. In 1872 he moved to Munich and in 1873 he married Wilhelmine Lahmeyer (1849-1934). In Munich he had a studio in the Schwantalerstrasse. Following the advice of Lenbach he travelled to Italy in 1873-1874. Together with Gedon, Lenbach and Makart he went to Antwerpen during the Rubens year in 1877. 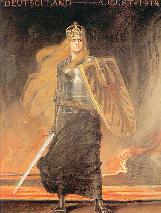 He became popular in Munich after he painted the "Schuetzenliesl" for a beer hall in Munich. In 1882 he became a member of the academy in Berlin. He had started with genre pieces, but from 1883 onwards he specialised in portraits. Around this time he visited Paris several times and saw the works of Gustave Courbet. In 1886 he was knighted by Prince Regent Luitpold of Bavaria and he succeeded Karl von Piloty as the director of the academy in Munich. Between 1887 and 1889 Gabriel von Seidl built a city palace for Kaulbach in Munich. He divorced his first wife and in 1897 he married for the second time. His new wife was the Danish violinist Fride Scotta. Together they had three daughters. In 1898 he portrayed emperor Wilhelm II. Among his friends were Lenbach, Von Stuck and Gulbransson. 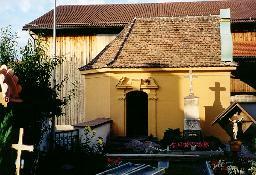 In recent years his house in the small Bavarian village Ohlsdorf has opened as a museum. The mausoleum for Friedrich August von Kaulbach in Ohlstadt. 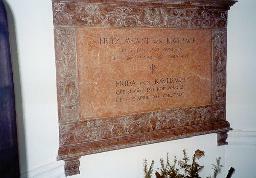 Inside of the mausoleum for Friedrich August von Kaulbach in Ohlstadt.